As part of a series of electronic professional development experiences, the NASA Explorer Schools project and the National Science Teachers Association are hosting a 90-minute live professional development Web seminar on Feb. 13, 2013 at 6:30 p.m. EST. This seminar showcases two lessons from the “On the Moon” educator guide: “On Target” and “Feel the Heat.” Learn how to use the engineering design process to challenge students to solve problems related to exploring the moon. This session will fully prepare you to implement these activities in your classroom. This is the last time during this school year that this Web seminar will be offered. NASA Explorer Schools and the National Science Teachers Association are hosting a 90-minute live professional development Web seminar on Oct. 10, 2012, at 7:30 p.m. EDT for educators of grades 6-12. This seminar showcases two lessons from the “On the Moon” educator guide: “On Target” and “Feel the Heat”. Learn how to use the engineering design process to challenge students to solve problems related to exploring the moon. This session will fully prepare you to implement these activities in your classroom. For more information and to register online, visit the seminar registration page. NASA’s Lunar Reconnaissance Orbiter, or LRO, has returned data indicating ice may make up as much as 22 percent of the surface material in a crater located on the moon’s south pole. The team of NASA and university scientists using laser light from LRO’s laser altimeter examined the floor of Shackleton crater. They found the crater’s floor is brighter than those of other nearby craters, which is consistent with the presence of ice. This information will help researchers understand crater formation and study other uncharted areas of the moon. The findings are published in the journal Nature. To read more about ice on the moon, visit: https://www.nasa.gov/mission_pages/LRO/news/crater-ice.html. This story features the lunar exploration mission LRO and is directly related to NASA Now: Lunar Mathematics and Mapping, as well as the NASA Explorer Schools featured lesson “Engineering Design Process: On the Moon.” To view this edition of NASA Now or to use this lesson in your classroom, visit: http://explorerschools.nasa.gov. One of two NASA spacecraft orbiting the moon has beamed back the first student-requested pictures of the lunar surface from its onboard camera. Fourth grade students from the Emily Dickinson Elementary School in Bozeman, Mont., received the honor of making the first image selections by winning a nationwide competition to rename the two spacecraft. To read more about this student opportunity and see the image, visit the NASA feature story page. This story details an opportunity NASA opened to students to rename two spacecraft and of students getting involved in moon research serves as an excellent extension to the NASA Explorer Schools featured lesson, Engineering Design Process: On the Moon. Be sure to share this with your students who have completed this activity. To access this lesson, visit the NES Virtual Campus. Patricia Smeyers, a teacher from Secaucus Board of Education, has a great idea for a Lunar Rover Project. Students design a new lunar rover for the future. They create their designs using cloud-based 3-D modeling software and present their engineered 3-D model and research. The students used an online educational collaborative website to create their presentation and used a wikispace to house their projects. This activity reinforces the best practice — use of technology to facilitate student collaboration — while incorporating NES materials and NASA opportunities. Read the article in NEON to find out about specific websites and programs supporting the educational goals of this project. NASA’s Lunar Reconnaissance Orbiter team released the final set of data from the mission’s exploration phase along with the first measurements from its new life as a science satellite. 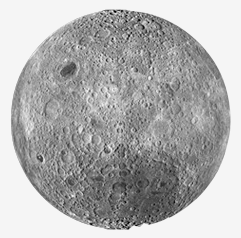 With this fifth release of data, striking new images and maps have been added to the already comprehensive collection of raw lunar data and high-level products, including mosaic images, that LRO made possible. The spacecraft’s seven instruments delivered more than 192 terabytes of data with an unprecedented level of detail. It would take approximately 41,000 typical DVDs to hold the new LRO data set. Read the NEON article to learn more about how LRO has given us the best view of the moon we’ve ever had and how to incorporate the LRO mission into the activities in NASA Explorer Schools’ On the Moon Educator Guide teaching modules.